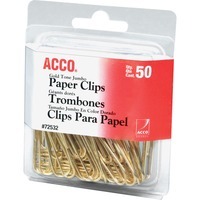 Smooth, gold tone paper clips are made in the USA. Durable gold finish adds a professional, upscale look to documents and maintains shine over time. Jumbo size, these clips securely hold up to 20 sheets. 50 clips per box.